The vendor landscape of the global telematics in heavy equipment market is becoming increasingly competitive due to the rising number of companies and the rapid pace of technological advancement in the field of telematics. Telematics solution providers are focusing on providing solutions with integrated wireless connectivity and easy to use interfaces to acquire a larger consumer base, observes Transparency Market Research in a recent report. In September 2017, Geotab, a telematics company launched a new telematics device “Go8,” with connectivity on LTE networks, with big data, and advanced GPS technology. Introduction of such innovative products is expected to help companies to acquire a larger share in the growth opportunities offered by the market. Some of the leading companies in the market are Navman Group, Heavy Construction Systems Specialists Inc., Geotab Inc., Topcon Corporation, Zonar Systems Inc., Teletrac, Trimble Inc., LoJack Corporation, ACTIA Group, and The Morey Corporation. According to the report, the global telematics in heavy equipment market is expected to rise to a valuation of US$1,743.8 mn by 2025, registering an impressive CAGR of 11.5% from 2017 to 2025. Geographically, North America emerged as the leading revenue generating region in the global telematics in heavy equipment market, followed by Asia Pacific. The Asia Pacific regional market is likely to expand at the highest CAGR over the report’s forecast period. 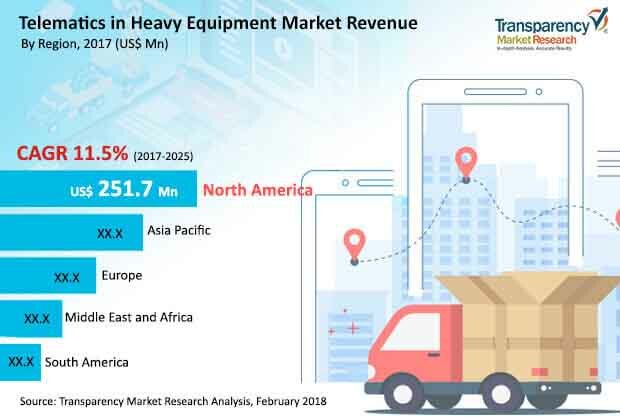 Factors such as the rising consumer base of mobile devices and presence of a thriving construction sector and the availability of a large number of heavy duty equipment in the region are expected to boost Asia Pacific telematics in heavy equipment market over the forecast period. In terms of key applications, the global telematics in heavy equipment market is expected to acquire a large share in its revenue from the construction sector in the next few years owing to the increased need for the safety of drivers and workers. The global market for telematics in heavy equipment sector is chiefly driven due to the rising demand for various field positioning capabilities offered by the telematics. The vast rise in the usage of portable mobile computing devices such as smartphones, rapidly expanding network of high-speed internet, and the vast set of benefits that telematics offer, including driver-alert control systems and collision warning systems in vehicles, has also increased the adoption of telematics in heavy equipment. The global telematics in heavy equipment market is also benefitting from the rising demand from the thriving global construction industry. The penetration of telematics in construction sector is increasing significantly as number of OEMs are implementing telematics solutions in their equipment for added benefits such as keeping an effective track of equipment performance. Operators are realizing more benefits of telematics such as theft reduction, reduction in fuel consumption, and improved efficiency of heavy equipment. Telematics also provides safety to fleet operators by enabling them to observe noise limit requirements and real time site access. These factors are expected to have a significant impact on the overall development of the global telematics in heavy equipment market.